Last night, 7.15.11, after a delightful meal at Bob and Laura’s amazing private spiritual retreat in the hills of LA I, Laura and I went out to look at a moon we’ve been hearing is very powerful for the work of a gentle 2012. I had left my glasses in their home somewhere and so when I gazed up at the bright moon, the brightest I’ve ever seen I at first thought I was simply seeing double exposure as sometimes happens with my eye issues when I don’t have on glasses. But what I was seeing was far more than a double image could create. I was seeing a perfect lotus flower superimposed over the moon. 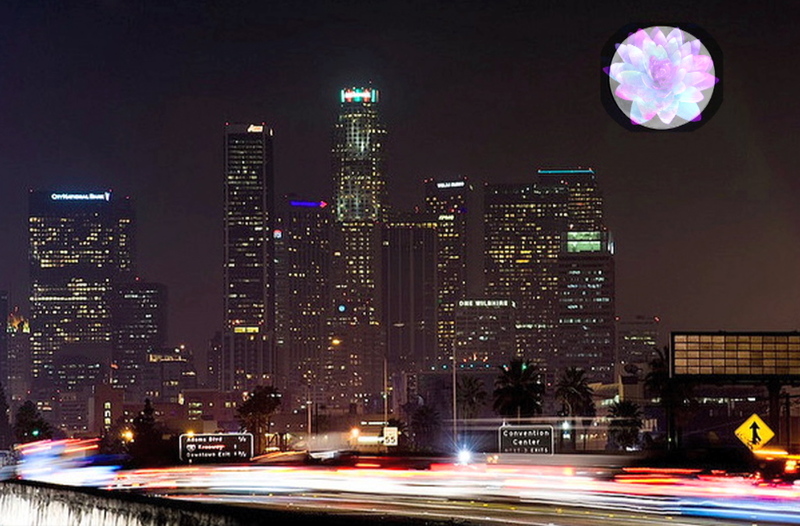 I feel its important enough to report to you by recreating what I saw using this photo of LA where I witnessed the Lotus moon. According to legend, the lotus flower represents the power of people to change for the better. Something Laura De Leon sang of at our June DreamShield event. We need your donations to support for the 11.11.11 global event and the work of manifesting a gentle 2012. Donate at DreamShield.org. On 11.12 2011,at about 22:00,I also have seen the Wonderful White Lotus Flower in the Moon,very illuminating and bright.. Since i sow it i am searching for the meaning of it and i am sincerely amazed that somebody else in this world have seen Lotus Flower in the Moon!! Do you really know what is the meaning and why the other people (who were with me) did not see it?